Lovey is a mini-blanket with amigurumi doll. This cute accessory can be made in no time, and will bring joy to any baby! It’s a lovely idea for last-minute baby shower gift or something to add to a nursery. Today in our collection of Crochet Baby Lovey Ideas you can find couple of examples. Sweet bunnies and a koala bear can become your baby’s best friends. This kind of toy is safe for newborns. Experiment with shapes and colours! Links to free patterns can be found under the pictures. 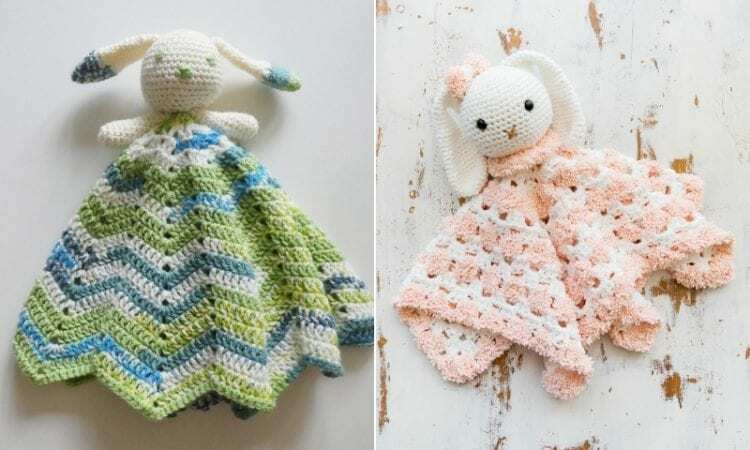 This sweet bunny lovey is made with the use of basic granny square. For more free designs every day follow us on Facebook. Share your ideas and your work on our Facebook group! Learn how to make these cool ripples by making this toy. For more free designs every day follow us on Facebook. Share your ideas and your work on our Facebook group! Furry koala will be your baby’s best friend. For more free designs every day follow us on Facebook. Share your ideas and your work on our Facebook group!